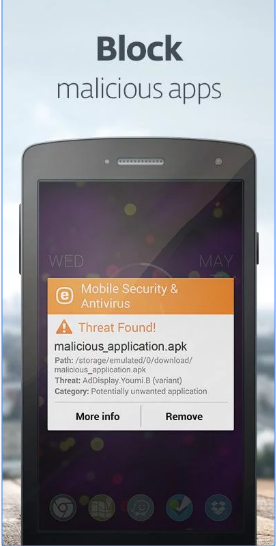 Protect your android & smart phones from viruses & threats using eset mobile security & antivirus apk. 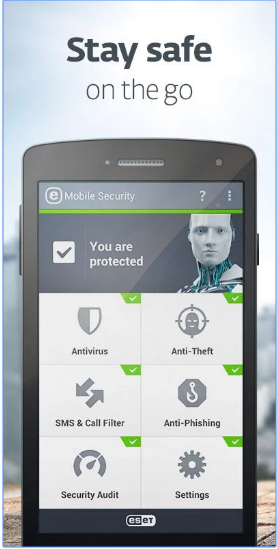 Eset is one of the popular antivirus app that will smartly enhance your phone security. After installation, it will automatically start scanning your applications, files, folders, & media for malicious programs. It will notify you the complete report after the scan. You can either run a quick scan or a full scan scan. It also support feature of on-demand scan which you can enable at any time. It will either remove all the harmful programs or Quarantine them so that they could not be able to provide any further damage to your phone. By using the feature of Anti-theft, you will be able to remotely control your phone in case of lost. You can lock your phone under a strong password in that case. You can also remove your important data so that if some body has access your phone, then he will not be able to go through your important data. The user interface designed for Eset security app is very dynamic, fluid, & user friendly. This app will notify you about any suspicious activity. You can also schedule scan so that no do not have to restrict your self to scanning. The phone will start scanning after the prescribed time. It will also make your internet browsing safe by blocking all those sites & URLs which contain malicious/spam content/programs. It will also monitor important settings. Eset mobile security acts like call/sms blocker. If some body is making you annoy by continuously by making calls or sending sms, then you can easily block that contact. You will no more receive any message from that contact. It will automatically update to its latest version in order to fight against any harmful or latest virus. Whenever some one tried to unlock your phone or tried to change SIM, then you will receive notification. It can also capture front & back camera picture. With anti-theft feature, you will be able to locate your phone in case of lost. You will also be able to remotely lock your phone or can even wipe out all the information so that no body can take access to that information. In order to enhance your phone security, you will have to grant some permissions to Eset mobile security. This app will not use those permissions for any other purpose except increasing security of your phone.